Pasquale Pistorio graduated in 1963 in Electrical Engineering from the Polytechnic of Turin with a Degree in Electronics. He began his career as a salesman for Motorola products and in 1967 he joined Motorola in Italy, rising through the ranks to become Director of International Marketing in July 1977, based in Phoenix, Arizona. At the same time, he was appointed Vice President of Motorola Corporation and soon after, in November 1978, he was promoted to General Manager of Motorola’s International Semiconductor Division, responsible for design, manufacturing and marketing activities for all regions outside of the United States. In July 1980 Pistorio accepted the challenge to return to Italy as President and Chief Executive Officer of the SGS Group, the only Italian microelectronics company. His unwavering commitment to build the company into a profitable broadline semiconductor manufacturer led to one of Pistorio’s most significant achievements to date: the successful integration of SGS with the French semiconductor champion, Thomson Semiconducteurs, in May 1987. This was a powerful merger, which put the newly formed company, SGS-THOMSON Microelectronics (renamed STMicroelectronics in 1998), in a much better position to compete on the international market. As President and CEO of the new company, Pistorio has been responsible for developing ST’s diverse product portfolio based on high-growth applications, as well as its worldwide network of strategic alliances. This business model has proved so successful that ST is now positioned at the highest level in the worldwide ranking of semiconductor companies. Given the successful performance of the company, shareholders decided to list ST’s shares on the New York Stock Exchange and the Paris Bourse. This 1994 listing was followed by the listing on the Borsa Italiana (Milan Stock Exchange) in 1998. In the last two decades, Pistorio has championed the cause of Europe’s microelectronics industry and his role has not been one of pure theory but has produced concrete and important industrial results. Throughout his career, Pistorio has also been a staunch advocate of environmental protection. He passionately believes that companies such as ST should continually strive to be at the forefront of the sustainable development movement. This belief is based not only on ethical and social grounds, but also on the more practical need to attract and retain young, talented employees. It also stems from his firm conviction that environmentally friendly companies are more financially competitive. As a firm believer in corporate social responsibility, Pistorio takes a special interest in the cause of fighting the Digital Divide — the huge imbalance between those who have access to information technology and benefit from it and those who do not. As a member of the United Nations Information and Communications Task Force dedicated to bridging the Digital Divide, he helps develop proposals to attract corporate attention and commitment to this new worldwide challenge. 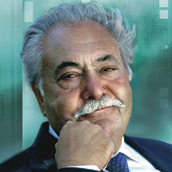 Upon his retirement as President and CEO of STMicroelecronics on March 18th, 2005, Pistorio was appointed by the Company’s Managing Board as Honorary Chairman, where he acts as an ambassador of the Company while continuing to make available to ST, as appropriate, his wealth of experience and insight into the semiconductor, electronics, and industrial worlds. In April 2007, Pistorio was appointed Chairman of the Board at Telecom Italia, Italy’s leading ICT enterprise. March 2009 – nominated “Commandeur de l’Ordre National du Mérite” by the President of the French Republic on March 25, 2009. May 2012 received ”Ellis” Island Medal of Honor Award for his philanthropic and humanitarian work. In addition, Pasquale Pistorio has received honorary degrees from the University of Genoa, the University of Malta, the University of Pavia, the University of Catania, the University of Palermo, the University of Sannio, Benevento, the University Bicocca of Milan and the University Bristol UK.